Since I’ve been a day off all week, I decided to just keep it going. I’ll resume my normal posting schedule on Monday. 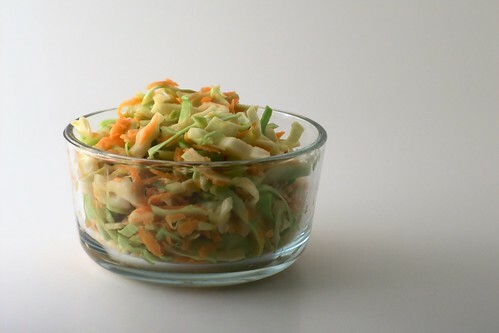 Often, we do something simple like grated cabbage, carrot and roasted corn with a simple vinaigrette. Or possibly just cabbage and carrot. That can get old pretty quickly, so I’ve been keeping an eye out for interesting variations to incorporate into our menu. In one of the issues of Cooking Light I received this year, they had an entire section devoted to cabbage salads, which seem to be referred to as ‘slaw’. I guess I never quite made the leap from “cole slaw” to “slaw” as a reference to shredded cabbage salad. In any case, we tried this one and were rather happy with it. It’s peanutty and spicy, crunchy and tasty. Adjust the chile paste to suit your taste – I preferred mine without quite as much spice as the original, so I started at 1/2 tsp. 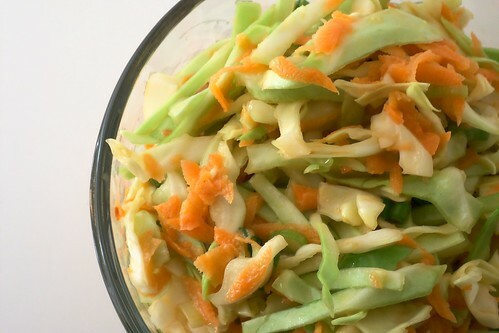 Combine carrot, green onions, cabbage and peanuts, if using, in a medium bowl. Whisk together remaining ingredients in a small bowl and pour over the vegetables. Toss well to combine. This entry was posted in american, asian, dairy-free, gluten-free, recipes, salad, untranslated, vegan, vegetable, vegetarian. Bookmark the permalink.